More and more bizarre stories are arriving from low-carb-eating Norway. 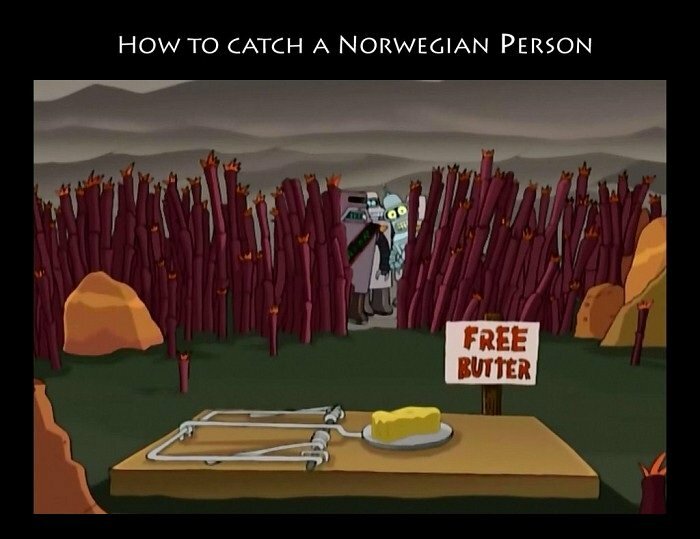 How about smuggling butter and selling it on the black market for about $70 a pound? This is not a joke, it’s apparently already happened. The picture above shows smuggled butter being confiscated recently. 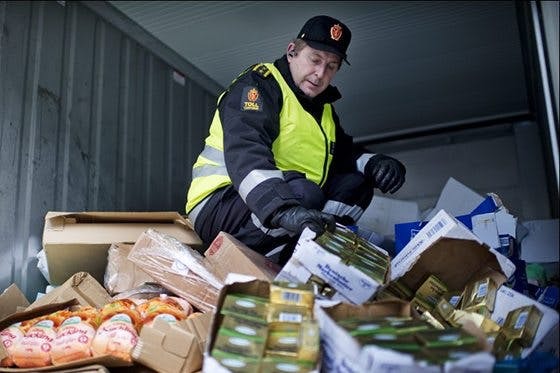 In Sweden the butter shortage that plagued us during the fall is now under control, due to increased imports. But who knows what will happen in 2012? The world’s production of butter may need to be increase to satisfy the ever-increasing Scandinavian demand. And what will happen as more countries stop fearing natural fat? Who'd have thought simple butter would ever become so hard to get hold of?! So long as they don't go for margarine when butter isn't available! Re: And what will happen as more countries stop fearing natural fat? Dr. Eenfeldt, isn't also the big question for meat? Not speaking Norwegian I'm confused as to why there would be a black market for butter and why the police and smugglers would have to be involved. Are they evading VAT, tariffs? Black market goods are less efficient, hence only profitable when there is some sort of artificial market barrier imposed by the government. Since Norway is outside EU, I guess there are customs that can be avoided. Also I suppose there are regulations about how food, such as dairy products, should be handled and sold. However, I guess the regular stores in Norway will start importing more butter shortly. But maybe they were not prepared for the fast increase in consumption, and have problems adjusting in time. (Just before Christmas which makes people desperate.) Or the shortage is somewhat staged from the dairy producer to be able to raise the prices, which I suspect at least in part was the case in Sweden. A F wrote, "Or the shortage is somewhat staged from the dairy producer to be able to raise the prices, which I suspect at least in part was the case in Sweden." Aren't there many dairy producers? And aren't they allowed to raise or lower prices according to market demand or their own whims? Unfortunately there is almost a monopoly situation in the most parts of Sweden, and I heard that the same is the case in Norway. But you are right that they can raise or lower prices, they are not set by the government at least. Okay, thanks. I suppose the government monopoly is linked with EU agricultural subsidies--or policy at least--I believe Sweden is quite a net payer in this regard. Finnish officials have told a family of low-carbohydrate enthusiasts that their children would be taken into care if they failed to heed nutrition advice, provincial paper Iisalmen Sanomat reported Sunday. Ursula Schwab, a clinical nutrition specialist at the University of East Finland, said at least one family had received such an ultimatum after parents ignored healthcare staff's warnings about the dangers of an imbalanced diet for children. "If a child's growth slows down because of a poor diet, one must send a wakeup call to parents," Schwab told the Finnish News Agency. "Should this prove ineffective, the child must be moved to a place where he receives enough nutrition." Schwab added that she knew of parents who had put toddlers on so-called low-carb diets. "A strict low-carb diet is very fatty, and it suppresses hunger. If you down eggs and bacon for breakfast it will take hours before you can even imagine eating again." "A growing child needs a varied diet." "We're sorry, currently our video library can only be streamed within the United States..."
It's not government monopolies we're talking about. In Sweden there is a case with one very large dairy producer, that has put pressure on grocery store chains to only keep their products etc. The grocery market as a whole is an unhealthy oligopolic market, getting a little better, though. Interesting anyway. It would be fun if it was all due to LC-mania, but there is more to it. I don't think these things are that one-sided. Aren't the companies that engage in such monopolistic behavior also engaged with the government, IOW, we are talking about crony capitalism? What if people were simply allowed to buy raw milk from their local farmer or farmer's market without them having to worry about government regulations? Would there still be a monopoly? In the case of Norway and government sponsored protectionist tariffs, are these things a coincidence? Who is more at fault? The rent-seeking dairy company or the public service employees and politicians who made the tariffs? I find it amazing that a government can force parents to stop giving their children protein and fat, but they are happy to recommend that they feed them 70-80% sugars all day long. It is just crazy. That mad nutritionist does not realise that the hunger suppression is the natural mechanism that all animals (including men) use as a feedback when the body has what it needs. Animals in nature never get undernourished if they have enough feed -only civilised people who listen to governments do. Incidentally, here's an article at Cato, a libertarian think tank, about Norway's butter shortage: http://www.cato-at-liberty.org/from-russia-with-butter/ and the Tine's government sponsored monopoly.